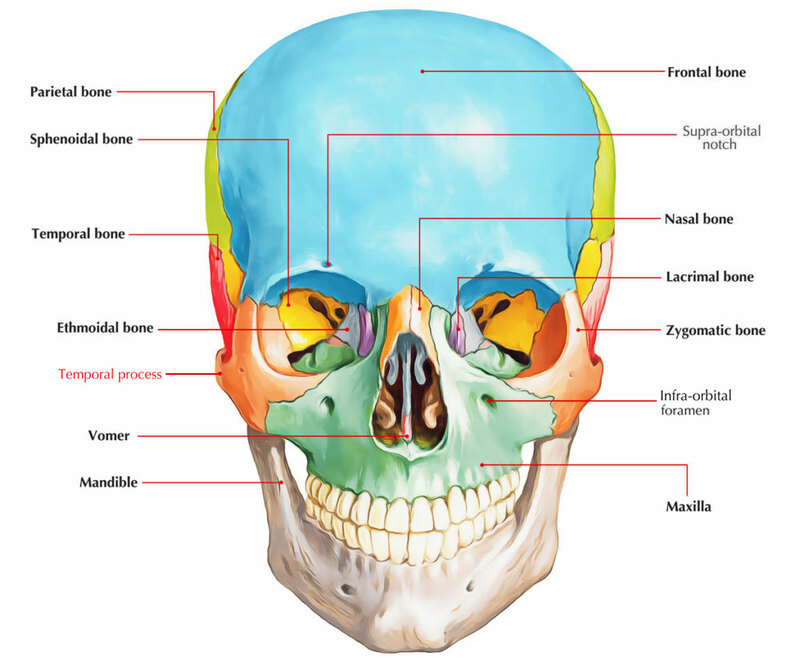 Temporal Process spreads out backwards and connects with the zygomatic process of the temporal bone in order to form the zygomatic arch. The temporal process terminates posteriorly within an oblique border, which joins with the boundary of the zygomatic process of the temporal bone. The temporal process is a bit thicker as well as rounded in the inferior margin. It spreads out where the bone communicates with the maxilla downwards and forwards towards the inferior angle. It merges there together with the ridge which splits the facial from the infra-temporal part of the maxilla. This edge of the bone is sometimes referred to as the masseteric border, as it gives attachment to the fibres of beginning part of the masseter muscle. The most protruding of the three, the fronto-sphenoidal process is combined superiorly towards the zygomatic process of the frontal bone. Extending downwards is a curved edge, in front of the fronto-sphenoidal process, which terminates inferiorly in a sharp process. This border creates the lateral as well as the inferior boundary of the orbital cavity in part. In the middle of the anterior extremity of the masseteric edge as well as the pointed anterior angle there is an asymmetrical suture through which the bone is combined to the maxilla. The edge in the middle of the frontal and temporal processes is thin as well as sharp. It gives connection to the temporal fascia, and generally near its upper end there is a prominent angle called Marginal Process or Processus Marginalis, created by an unexpected change in the course of the border of the bone. The zygomatico-temporal branch of the zygomatic nerve turns cutaneous just below this point.